I'm sharing our final free number game download for the year from MommyMaestra's sponsor, Spanish for You! For the last several months, they have been focused on helping students learn those higher numbers between 20 and 100. Today's download is the final file to help your young Spanish learners. If you missed any of them, you can find the free downloads here and here and here and here! 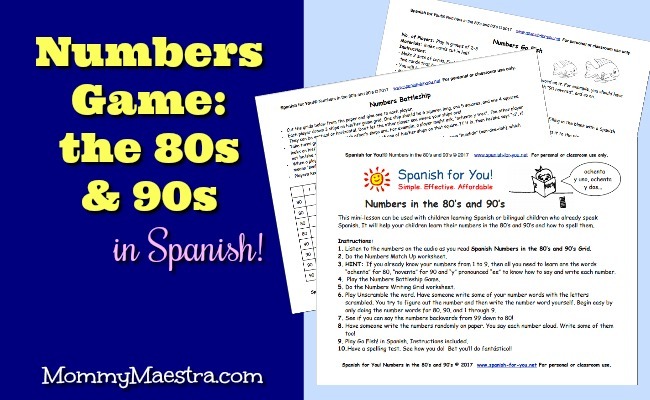 This 6-page mini-lesson will help your young Spanish learner memorize their numbers in the 80s and 90s. The file includes a page of directions, a number grid, a match up activity, a number writing grid, and two games: Go Fish and Battleship. As always, it comes with the audio file to help you learn proper pronunciation.